BOGOTA, Colombia (CNS) — Pope Francis urged Colombians to put aside prejudice and pursue peace through social inclusion, fighting inequality and paying attention to the plight of the country’s most marginalized populations, such as campesinos, Afro-Colombians and indigenous peoples. “I encourage you to look to all those who today are excluded and marginalized by society, those who have no value in the eyes of the majority, who are held back, cast aside. Everyone is needed in the work of creating and shaping society. This is not achieved simply with those of ‘pure blood,’ but by all,” the pope told Santos and government officials Sept. 7 outside the Casa de Narino, Colombia’s presidential palace. The speech — invoking St. Peter Claver, a Jesuit who fought discrimination and the slave trade in Colombia — was Pope Francis’ first official event on his five-day visit to the South American country. 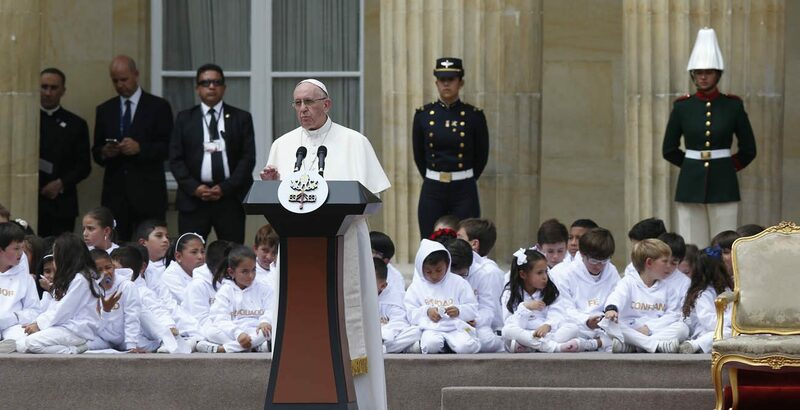 “Our gaze fixes upon the weakest, the oppressed and maltreated, those who have no voice, either because it has been taken from them, or was never given to them, or because they are ignored,” the pope said, as children sat behind on a platform in front of the presidential palace columns. Colombia’s government and a Marxist guerrilla group, the Revolutionary Armed Forces of Colombia, or FARC, reached a peace accord last year. The FARC is demobilizing and recently formed a political party. Another Marxist group, the National Liberation Army, is in talks with the government and agreed to a four-month cease-fire in the days before the pope’s arrival. The peace accord with the FARC has proved polemic; some in Colombia disapprove of FARC leaders receiving reduced punishments for committing atrocities and fear the presence of former guerrillas in the country’s political process. Santos, who has promoted the peace accord in the face of stiff opposition, called the pope’s visit a “push” to take the first steps toward peace and reconciliation. “It’s no use silencing our weapons if we continue armed in our hearts,” the president said. “It’s no use ending a war if we still pursue each other as enemies. That’s why were need to reconcile. “We trust your visit will open the hearts and minds of Colombians to the peace that comes from God and inhabits the souls of men. This is the peace we are constructing,” he told the pope.